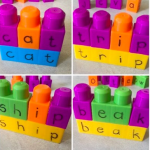 One thing I have learned working with children with learning disabilities: they need hands on activities in order to grasp a concept!The use of real building blocks for this CVC word building activity is just that! 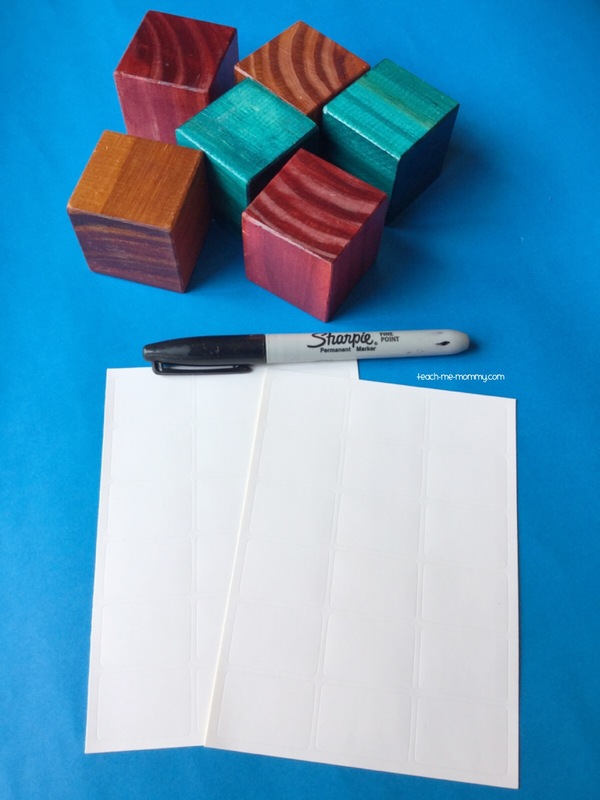 Write the letters on the stickers and stick it on the blocks. 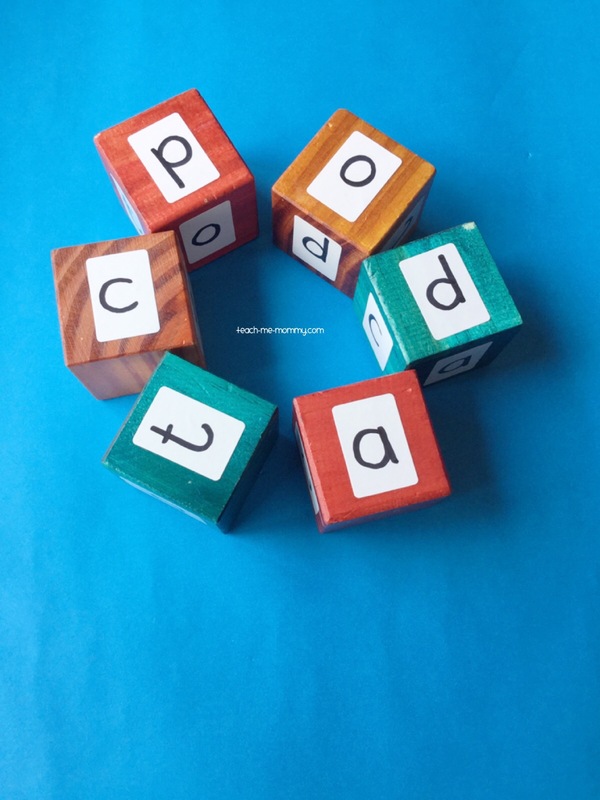 We have revised the letters c, a, t, o and p in the fist two weeks of school, that is why you will see only these letters on the blocks(I added a line underneath the letter p so it won’t be confused with a letter d after I took these photos). You can obviously use whatever letters your kids now and work with that. I like the idea of using stickers on the blocks, that makes it non-permanent and it could be changed or removed. 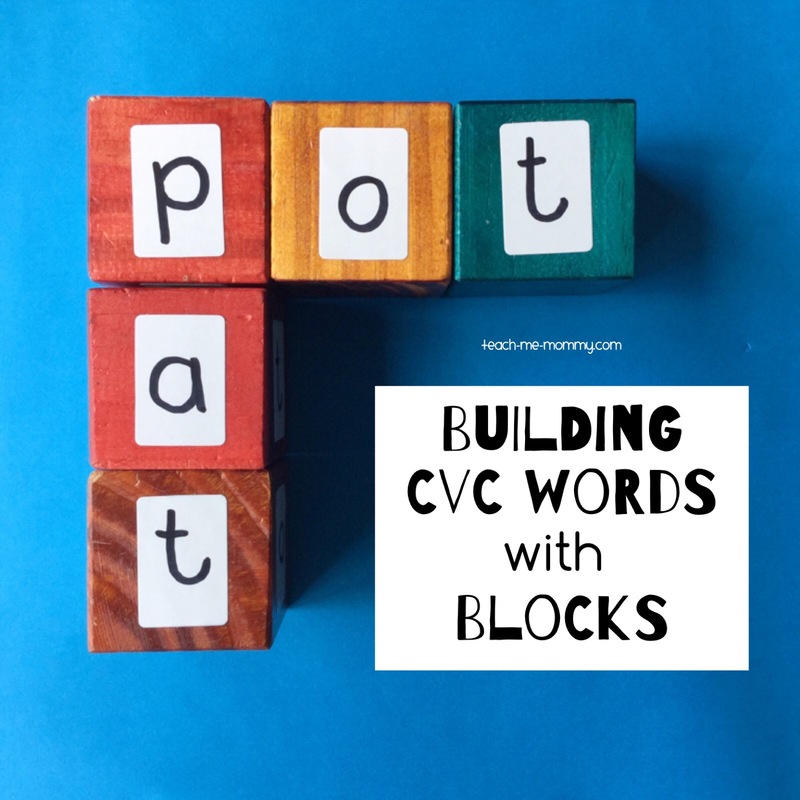 PS: You have to see these posts about Spelling with building blocks and CVC Dominoes. 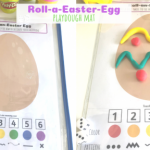 Both activities are fabulous, that is why they were added to two fab books! 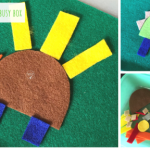 Find letters on the block: Show me your letter c, what sound does it make? 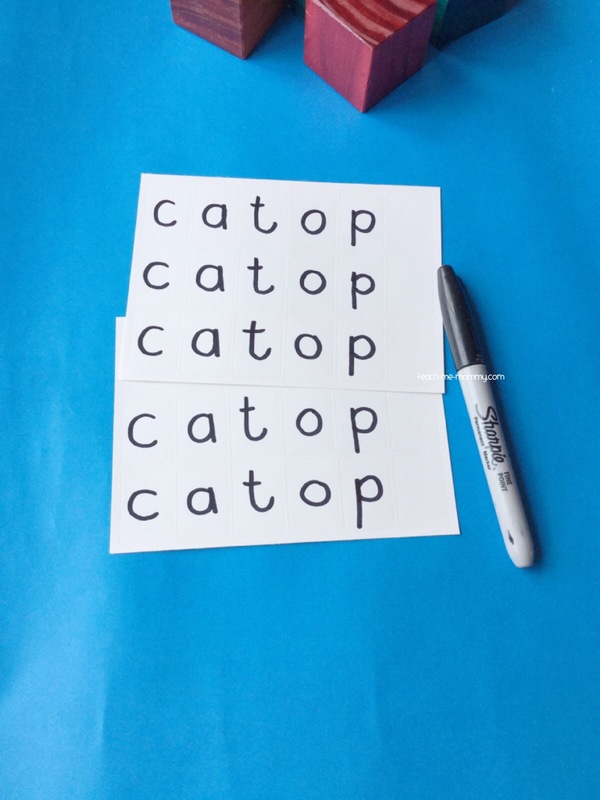 If I want to spell the word ‘cap’, which letter comes first? (kids show ‘c’) and then? (kids show ‘a’) and last? (Kids show ‘p’). Let’s spell the word ‘pot’ together. First child places down a ‘p’. Next child adds his ‘o’, last one adds his letter ‘p’. 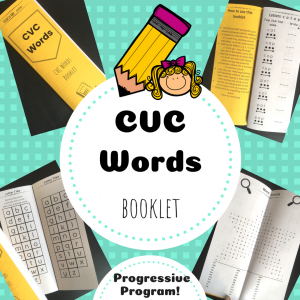 The next child can read the whole word. Phoneme manipulation: change the sounds in the word. For instance: let’s change the word ‘pot’ to ‘pat’. What needs to change? Now, let’s start a word with ‘t’. Which words start with ‘t’? ‘Tap’, ‘top’. Let’s build it. Which letter comes after ‘t’? And then? 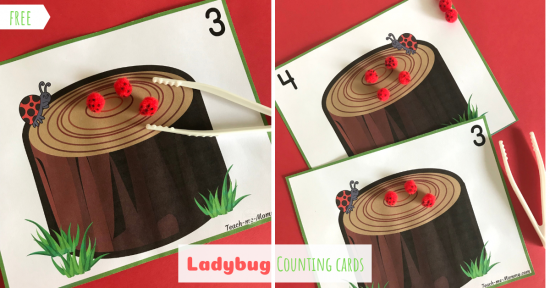 This is a great segmenting and blending activity, two skills kids need to spell, read and write. For an individual activity: Add the blocks to a container and shake it up. What does it spell? 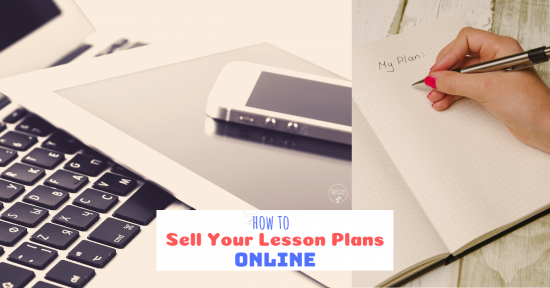 Or play a game of block scrabble: start with one word and build on! 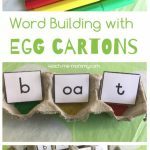 Make word building fun by using real blocks and your children will have a blast revising their CVC words! 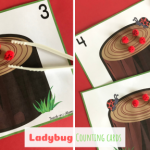 If you like this activity you have to check out this awesome book called ABC’s and 123’s with 40+ hands-on activities to work on letter, number and shape skills! 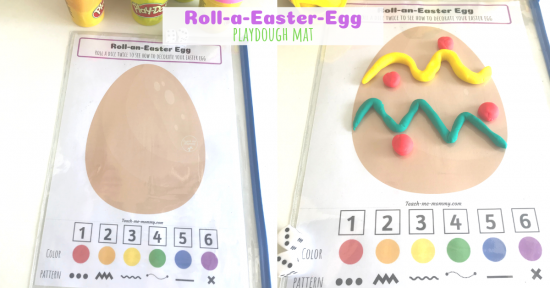 Love the different possibilities with this activity. 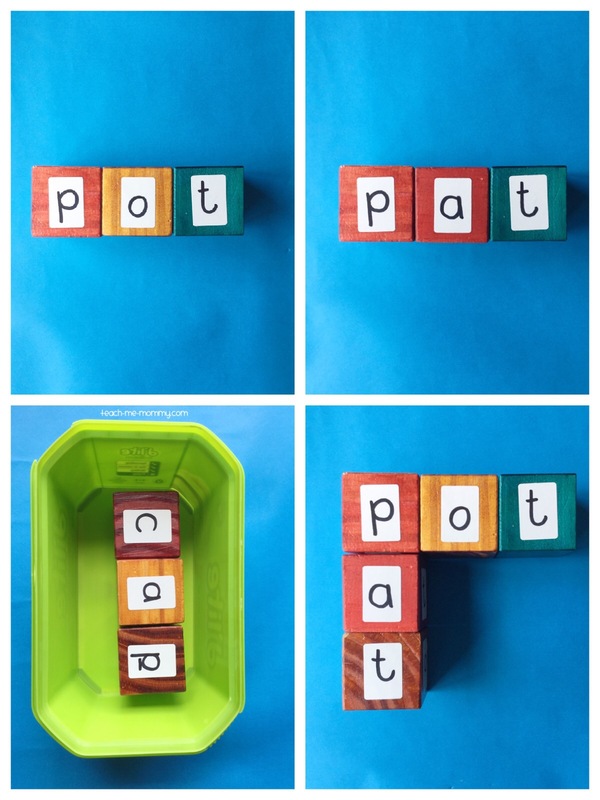 I’ve made some blocks like these too…….just something I do : I write the vowels all in red or put them on RED blocks. It helps for the isolation and understanding of the vowel sounds and their job. 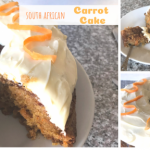 Nice post……..